Our interest is that the toy store keeper is Georges Méliès. 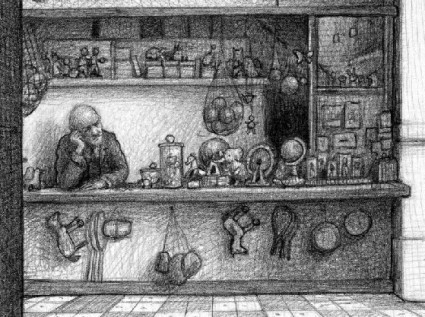 The illustration above from the book echoes the famous photograph of Méliès at his kiosk on the Gare Montparnasse, years after he had lost his film business and disappeared into obscurity, and just at the point of his re-discovery by film historians. Méliès becomes a leading character in the story, introducing Hugo to the world of early film. The book is a graphic-novel-with-text, and incorporates images from Méliès’ films. There’s a website, www.theinventionofhugocabret.com, which has information on the ideas behind the book, including a page on Méliès, and a Flash slide show of some of the book’s illustrations. There’s a video interview with Selznick, emphasizing his fascination for the Méliès story, on the ExpandedBooks.com site. It shows many illustrations from the book, from which we learn that Selznick makes a particular point of depicting shoe-heels in his drawings (Méliès’ film library was notoriously melted down to make, amongst other things, shoe-heels). Rumour has it that Martin Scorsese is considering making a film based on the novel, or at least that John Logan, scriptwriter for The Aviator, is writing a screenplay. Read this book a couple of months ago and have recommended it to friends ever since. The artwork is wonderful and the book reads like watching a film – is should be a children’s and adult classic IMHO. Richly deserved. I now have my copy, and it is a pleasure to own. Nothing further than rumours as yet about Scorsese’s intentions. “Ice Age” helmer Chris Wedge has signed on to direct Brian Selznick’s magic-themed children’s novel “The Invention of Hugo Cabret” for Graham King’s GK Films, Johnny Depp’s Infinitum Nihil and Warner Bros.
“The Aviator” scribe John Logan has been tapped to pen the adaptation. King and Infinitum Nihil’s Christi Dembrowski will produce the live-action film, which centers on an orphaned boy who secretly lives in the walls of a busy Paris train station and looks after the clocks. He gets caught up in a mystery adventure when he attempts to repair a mechanical man. The studio is eyeing a fall start date. GK Films and Warner Bros. acquired screen rights to “The Invention of Hugo Cabret,” a No. 1 New York Times bestseller, in 2007. After producing Martin Scorsese’s “The Departed,” King launched GK Films with partner Tim Headington in 2007. Through the company, King recently completed lensing the Emily Blunt starrer “The Young Victoria” on location in the U.K.
Logan’s credits include “Gladiator” and “Sweeney Todd: The Demon Barber of Fleet Street.” He is also writing the script for an untitled animated project for King and Gore Verbinski. The Invention of Hugo Cabret is an illustrated black-and-white children’s story, played out in 1930s Paris with its panels structured like the frames of a silent movie. Now the award-winning book looks set to find a new lease of life, courtesy of a film version by Martin Scorsese. The Oscar-winning director is reportedly in talks to shoot an adaptation of Brian Selznick’s 2007 story, which went on to win the Randolph Caldecott medal for children’s fiction. The film will be independently produced by Britain’s Graham King, who oversaw Scorsese’s work on the Oscar-winning 2006 thriller The Departed, with a script by John Logan, who wrote The Aviator. The Invention of Hugo Cabret tells the tale of a 12-year-old orphan boy who sleeps rough at a Paris railway station, where he labours to repair a clockwork figure that was left to him by his father. The author is a distant relation of David O Selznick, the famed producer of Gone With the Wind and The Wizard of Oz, and his book is filled with cinematic references, including a supporting role for the legendary film-maker George Méliès, who moonlights as a toy-maker. “The chance to see what [Scorsese] does with my story is – to put it mildly – thrilling,” Selznick told the Guardian. He may have some time to wait, however. Scorsese’s latest film, Shutter Island, opens in the US and UK on 19 February, while the director is currently editing his documentary about the late Beatle George Harrison. He is also reported to be planning big-screen biopics of both Frank Sinatra and Theodore Roosevelt, along with a saga about two Jesuit priests adrift in 17th-century Japan. Fans of Selznick’s book will be hoping for delays or derailments in those other projects so that Scorsese reaches the Paris railway station ahead of schedule. The latest information is that Sacha Baron Cohen, Ben Kingsley, Chloe Moretz and Asa Butterfield are to appear in Martin Scorsese’s film, with Butterfield as Cabret and Kingsley as Méliès.